This year's toorshi batch consists of 1 cauliflower, celery, carrots, green and red peppers, 2.5 heads of garlic (cloves left whole but peeled), fresh dill, 1 cherry red pepper and 8 habaneros. All but the cauliflower and the celery came from the farm share. I ended up with 2 half gallon jars and am just waiting for them to seal. I had a little taste before I packed all the veggies and it's already hot! I can only imagine what it will be like after it's pickled for a few weeks. Wow. I need more vinegar. For that matter, I need more jars. Finally, for dinner, I tackled the frozen beef/tomato leftovers from previous "slow cooker osso buco" dinners. I sauteed one leek, 2 onions (one red, one white), 4 carrots and 5 celery ribs with some of the leaves. Then I browned cubes of beef and added the frozen sauce, meat and bones. I added 2 c. red wine, 16 c. water, worcestershire sauce, 2 bay leaves, and some pearled barley. I also threw in some frozen peas. This simmered for about 2 hours and we had some for dinner, mmm! I put up 7 pints with the pressure canner (75 minutes, 10 lbs of pressure) and still have about 2-3 quarts of soup left. However, I'm out of pint jars again. I am seriously in danger of running out of space in my pantry again. The rest of the soup is in the fridge; likely we'll have some for lunch tomorrow. Yes, I did go and pick more raspberries yesterday - enough to make 5 cups of puree and give the kids a few to eat. The raspberries are winding down, it took a little longer and I gave up before I had a full 4 quarts of berries. While the syrup recipe calls for 6 cups of puree, it's an easy conversion to whatever amount you have. 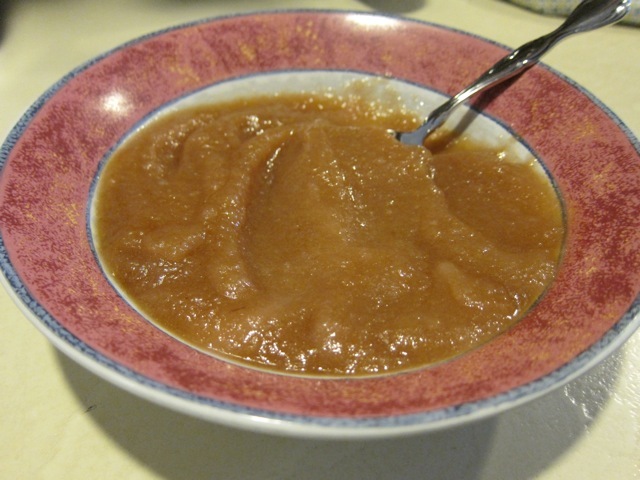 5 cups of puree, 8.3 cups of sugar, and 0.2 cups of lemon juice were brought to a boil and then simmered, stirring constantly, for 5 minutes. This made 5 pints of syrup. These get processed in the boiling water canner for 10 minutes. I left about a half-inch of headspace in each jar; the recipe didn't specify so I guessed. This morning I made pancakes with applesauce in the batter. I'd never done that before, now I wonder, why not? They were so yummy! One of my jars from yesterday hadn't sealed so I needed to use it first - I still have 8 jars in my inventory and I'm sure I will be making more. The apples from the farm share have just kept coming, and we haven't even gone apple picking yet! I had 2 pecks in the fridge as of this morning. I grabbed a peck and, in 2 batches, quartered them and boiled them (2 c. water per half-peck bag) then ran them through the food mill. I'd like to make chunky sauce but I think peeling apples is beyond my capabilities at this point. (As it was, I got the bandage wet while I was cleaning up and had to go change it. Oh! Did I tell you I was now in a plastic splint rather than fiberglass? I can now get it a little wet without major complications.) To the applesauce I added about 3 packed cups of brown sugar and some cinnamon. The end result was 4.5 quarts and a big bowl of the rest for lunch. 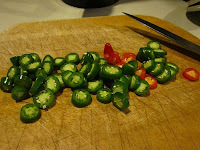 While I was at it, I pickled 12 jalapenos from yesterday's farm share. I used this recipe but I only made 1/4 of it. I skipped the carrots and onions, too. This yielded 2 half-pint jars. I like how they look, with a few red slices in each jar. Hopefully this afternoon I will go get more raspberries to make syrup. Depends on how I feel! This made 14 4-ounce jars. I had originally planned on peach but I can't peel them right now so nectarines worked better. The mulberries were thawed in the microwave and really shouldn't have been. They just didn't smell the same after that. They did taste fine, however. I used my immersion blender to mash them up. The final product is a nice pinky-red and tastes great! Now I have at least a start on my holiday gifts. 2 pumpkins, 3 heads of bok choi, 1 head of lettuce, 1 bowl of arugula, 1 large eggplant, 1 bowl of kale, 3 small zucchinis, 2 buttercup squashes, 1 delicata squash, 2 small broccoli crowns, 12 jalapenos, 1 pt. beans (yellow and purple), 3 sunflowers, 14 slicing tomatoes, 2 heirloom tomatoes, 1/2 pt. of cherry tomatoes, and 2 half-peck bags of apples (one for each of us). Today I'm taking as much to them as I can. We've eaten the zucchini, lettuce, some of the arugula, half the broccoli, and 2 tomatoes. I've frozen the rest of the heirloom and regular tomatoes, stockpiling them in the freezer until I can process them more easily (when my hand is better) - so far I have 3 gallon bags of tomatoes; one or 2 more ought to be enough! This morning, with assistance from my husband, I roasted the pumpkins in the oven for 90 minutes at 400 degrees and then scraped the pumpkin into my brand new Kitchenaid stand mixer. I added cinnamon and nutmeg at the correct proportions to make pumpkin bread with the results and came up with 2 pints of spiced pumpkin plus another cup (not enough to can...of course). What I discovered is that it would be easier and better to use the food mill but, since it's hard for me right now to assemble/disassemble the mill, the mixer will have to do. The 2 pints of pumpkin are currently being processed in the pressure canner at 10 pounds of pressure for 55 minutes. My fridge and freezer and backed up with projects - in addition to the tomatoes, I now have a peck of apples, the base for another batch of beef and barley soup, 1 qt. blackberries, 1 pt. each of black and white mulberries, and 2 bananas. Add to that the grapes my sister-in-law froze which she harvested from her back yard and I have a lot to do! I haven't blogged in a while, I know. I've been away. Really away. ("what about the hand?" - "that part comes later.") We took the kids and went to Europe for almost 3 weeks. Zurich. Paris. London. Reykjavik. It was a trip to remember! We toured Notre Dame, stood atop the Eiffel Tower in a rainstorm (brrr), walked amongst the stones at Stonehenge. Toured Westminster Abbey and attended Evensong at St. Paul's Cathedral. Swam in the Zurichsee. Stood on an island in the middle of a waterfall. Found my ancestors' home in Besselsleigh, England, and met about 30 of our cousins in Iceland. Rode Icelandic horses, soaked in the Blue Lagoon, and watched geysers erupt. And so much more! It was an amazing trip. And then, on the very last night, I fell. Also a trip to remember. I broke my pinky finger on my right hand. Not in an insignificant way, either. When I sat up, my first thought was, oh, it's just dislocated. I tried to put it back. I succeeded in at least getting it pointing in the correct direction and freaking out my family at the same time. It was at that point that we all decided that I needed to go to the hospital. Now I am home, sporting a bulky fiberglass splint, and awaiting Tuesday, when it will have to be pinned. I am not sure how the recovery time frame is supposed to go and at which point I will have more use of the rest of my hand. I do know I can't work with patients until the pins come out and that is wreaking all sorts of havoc on the precariously balanced shift schedule. But I also know that I am not one to just sit around. Therefore, I am canning. I went raspberry picking with the 5-year-old yesterday, which was a riot. Kindergarten starts on Monday, so this was our last midday outing for a while. What was especially amusing was discovering that every raspberry that the 5-y-o picked was gently mouthed to see if it was juicy enough before it went into the bucket. Thankfully there were only 32. A running count was kept. But it was a joy to be outside, in lovely weather, hearing the wee one, no longer so wee, sound so happy. Today I am slowly making 2 batches of jam: seedless raspberry and peach melba. For the latter, I ran 3 peaches through the food mill with the raspberries since I couldn't cut them easily or peel them. I got about 1.5 cups of peach juice, can't really even call it puree, and I'm combining that with 2.5 c of crushed raspberries, including the seeds. I'm managing OK, with a glove on my right hand that at least keeps the splint dry. But, I think, I may have to keep those other canning projects in the freezer for a while, and maybe I won't be putting up peaches this year. I'll try to be OK with that. Since this is also a day to be somber and thoughtful, I will be counting my blessings.